We do an expert work during garage door maintenance and provide our service in the Friendswood area in Texas. All professionals in our local team have long experience in residential doors and openers, and follow specific checkpoints in order to tune up each system effectively. During their routine inspection, they note down the weak parts of the door in order to fix their problems. The ultimate goal of our routine service is to make the door more durable and long-lasting and this is accomplished by thorough examination and repairs. As an experienced company in residential doors, Garage Door Repair Friendswood TX can maintain any door brand, size and type with equal professionalism. 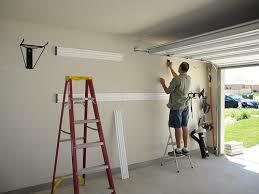 The benefits of our garage door maintenance Friendswood service are numerous. The main purpose of annual and routine inspection and service is to ensure that the whole system works properly and safely. In a different case, problems start making your life difficult. With the parts well-lubricated, adjusted, tightened and aligned, their movement will be smoother. The long-lasting effects of our maintenance service are obvious. The door behaves better, shuts and opens to the right position, and is not a threat to your family. These are the main steps of our garage door maintenance service. Call to make an appointment with us for garage door maintenance in Friendswood, Texas, and enjoy the results of our work.